The Blood and Sand is a classic example of a recipe you shouldn’t judge without tasting. Shake all ingredients well and strain into cocktail glass. 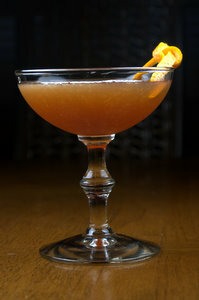 Garnish with orange twist or brandied cherry. This recipe doesn’t look like it could possibly work. And yet it does, and when well balanced, it works very, very well. The scotch is strong enough to stand up to the cherry brandy and sweet vermouth, while the orange juice gives a nice balance throughout. This is frequently given as an equal parts recipe (as it is in the BarSmarts workbook), but I find that version too sweet and heavy. Increasing the Scotch and orange juice creates a nice blend of flavors, allowing the Scotch to show itself without overpowering the whole drink. While I frequently double strain orange juice cocktails, I like how the pulp gives the “sand” look to this drink. This cocktail packs a lot of flavor punch, while being relatively mild in terms of alcohol; Cherry Heering is 24% ABV/48 proof. I haven’t yet seen the namesake 1922 movie, which is based on a novel by Vicente Blasco Ibáñez in which Valentino plays a bullfighter who rises to the top, marries is sweetheart, has an affair, and dies in the arena. Nor have I seen the 1941 Tyrone Power remake. I hadn’t even heard of the 1989 remake staring Sharon Stone as the mistress. I shall put at least the Valentino original on my Netflix list, and will be sure to sip a delightful Scotch cocktail while viewing it. This is one of my fav cocktails and i haven`t had it for a while and inow i got inspired to make me one. Nice pic! I agree with cutting back the sweet vermouth on this one; perhaps I haven’t found the right vermouth yet, but it has always seemed a little overbearing at equal parts. It’s the whiskey that puts the backbone, and the flavor profile, in this cocktail–I learned the hard way that there’s no way to disguise a Scotch you don’t like! I love the Blood & Sand. It was a cocktail that I never really thought about trying, and then one of my favorite bartenders in LA suggested it for my girlfriend and I got a try. I’m not a Scotch guy but I keep a bottle or two around the house almost exclusively for this cocktail. Make it with Carpano Antica and don’t waste your time with other vermouths. I haven’t found another sweet vermouth that works as well. The closest I’ve found is Punte Mes. That particular glass was a thrift store find. I also occasionally have good luck at places like World Market. But it takes a lot of looking, as so many places have those ridiculously large sizes. I love the Blood & Sand. It was a cocktail that I never really thought about trying, and then one of my favorite bartenders in LA suggested it for my girlfriend and I got a try. I’m not a Scotch guy but I keep a bottle or two around the house almost exclusively for this cocktail. Make it with Carpano Antica and don’t waste your time with other vermouths. I haven’t found another sweet vermouth that works as well. The closest I’ve found is Punte Mes.